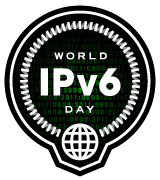 World IPv6 Day was a global event in which organisations around the world offered their content over IPv6. As all of the RIPE NCC's services and content had already been available over IPv6 for some time, we participated by extensively measuring World IPv6 Day. Find out what we learned from the analysis of measurements taken on World IPv6 Day. For all other measurements we did for World IPv6 Day, please refer to RIPE NCC World IPv6 Day Measurements. For a more detailed description of these measurements, please read RIPE NCC Measurements for World IPv6 Day. World IPv6 Day was celebrated at Science Park, Amsterdam. Tutorials, workshops and a panel session discussing the need for IPv6 took place. Keynote speakers presented and global IPv6 progress was monitored and shown during the day. The event was co-organised by several Dutch research and ICT organisations (University of Amsterdam, University of Applied Sciences, Amsterdam, Surfnet, NLnet Labs, RIPE NCC, AMS-IX, Internet Society Netherlands, the Dutch IPv6 Task Force and others). World IPv6 Day was celebrated during the RIPE Day at the First Eurasia Network Operators Group (ENOG) Meeting in Moscow, 6-8 June 2011. Throughout the day, there were IPv6-related presentations, a special meeting for the press and screens tracking the measurements the RIPE NCC conducted during World IPv6 Day.